1934 MERCEDES BENZ 540K ROADSTER REPLICA RARE 1991 MERCEDES BENZ 540 OR 500K FACTORY BUILT CLASSIC CAR. 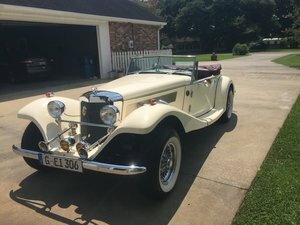 IT HAS BEEN IN STORAGE FOR A LONG TIME AND WILL REQUIRE A BATTERY AND A COUPLE DAYS OF MECHANICS SERVICE IT HAS JUST A LITTLE OVER 8200 ORIGINAL MILES AND LEATHER SEATS THAT LOOK AMAZING. TOP LOOKS NEW BUT HAS A SMALL TEAR. Built in 1991, Super customized to look as close as possible to the real MB. The paint is faded but in good condition as well as the chrome all around the vehicle, NEEDS New Wide White Wall Classic tires, has a special spare tire and MB hub caps, convertible top, suicide doors, roll up windows, has factory air conditioning that will be very nice to allow you to enjoy THE CAR!!! Real leather bench. Classic instruments, WOOD Steering wheel, LEATHER interior STILL VERY NICE, spacious trunk, tan carpet in good condition inside and also in the trunk, 2 piece hood, cowl lights, center fog light & badge bar, side moldings that look very similar to the real deal, authentic looking turn signals on the front fenders, supercharged pipes + chrome rings and many more things to look as close as possible to the real deal !!! Built on FULL SIZE CHEVY custom frame, very solid, this is NOT your average small kit car, this is a big and heavy automobile built after the exact measurements of the real Mercedes. Very well built automobile with just over 8K miles FROM NEW BUILT IN 1991, Powerful GM 350 Chevy Camaro engine, use it as a daily driver, or just when you want to have some fun, A well built classic, power steering, power brakes, AC. Not a new vehicle, signs of wear IN THE PAINT and age are present around this car. Please Note The Following **Vehicle Location is at our clients home and Not In Cadillac, Michigan. **We do have a showroom with about 25 cars that is by appointment only **Please Call First and talk to one of our reps at 231-468-2809 EXT 1 ** FREE Consignment Visit Our Site Today Easy To List Your Vehicle and Get it Sold in Record Time.